Oh, you read me right. I am officially better than some of the most brilliant minds on the planet at keeping my shiz in order. I may have dust bunnies the size of Sam Winchester* under my bed, but at least my trash isn’t orbiting the Earth and threatening to decimate Idaho. But did you guys read that article in the New York Times about how we are only just now considering doing something about the huge amount of space junk we so generously left behind for the past 50 years? Apparently, it’s becoming a hazard. Like, “hey, there are 20,000 pieces of junk just hanging out up there and most are the size of a Greyhound bus” kind of hazard. Yes, we take the same healthy attitude of “meh” toward destroying space as we do with our very own planet. Now, I know I’ve written about my lack of domestic skills before (here and here and here, for example), and I’m not going to lie, I used to beat myself up about it. But HA! Not anymore. Cause while I may currently be going commando because I’ve been too lazy to do laundry for three weeks, at least my mess isn’t large enough to warrant our Martian neighbors giving the TV show “Hoarders” a call. **Which would also make a great band name…DIBS! 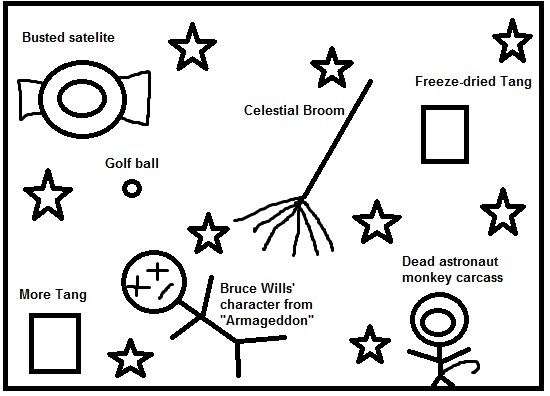 This entry was posted in Humor and tagged Aprill Brandon, awesome band names, celestial broom, CleanSpace One, hoarders, humor, NASA, New York Times, space junk, undomestic goddess. Bookmark the permalink. Now there’s food for thought. I have read about some of the ways they have thought about cleaning up the space junk up there. I would say for the PC way to go is to collect it and take care of it. I would be very upset if E.T. came after us for bouncing our junk out to space and cause him to wear out his finger light. Sorry did not get the nerdy reference. I do not know who Sam Winchester is, and what it has to do with dust bunnies, unless Sam Winchester is the maker of the rifles, but bullets are not really that big after being shot. As for Sam Winchester, he’s a character on the TV show “Supernatural,” which has a cult following. And the dude is HUGE. Like 6’6″ or something.